Doesn't this look so good, I thought I might rouse myself to do some fancy cooking for a change. But somewhere in between not finding fresh rhubarb at Stanley's and then looking for frozen but then finding fresh at the good old Jewel, I semi-realized that there's the rhubarb and rosewater syrup gorgeous blonde photographer type and then there's me who can't be bothered with straining out perfectly good fiber. And anyway, I lost the strainer in my divorce. Rhubarb and spinach both contain oxalic acid, and my remedy for both is to soak them. I feel like it helps prevent spinach teeth with spinach, and I don't really know what it does for rhubarb. Anyway. Cut the rhubarb into six-inch pieces and soak in cold water for twenty minutes, then drain and cut into half-inch pieces. Bring the orange juice, sugar, and salt to a boil and add the rhubarb pieces. Let cook for ten minutes. 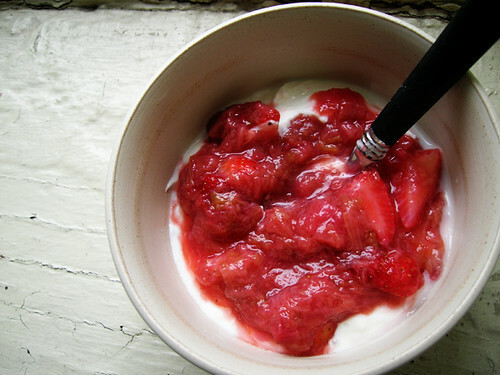 While the rhubarb is cooking, you have just enough time to hull and quarter the strawberries. But then you have to let the rhubarb cool to room temperature, anyway. So. When the rhubarb is cool, stir in the strawberries and put the strawberries in rhubarb in the refrigerator until ready to serve. Serve over greek yogurt. Or waffles. Or pancakes. Or french toast.